1994-02 Dodge Ram Cummins. 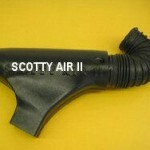 The Scotty Air II reduces exhaust gas temperatures better then any other intake on the market today. The more power you add and the heavier you tow, the better it works! You must also take into consideration that at a certain point on the climb to greater horsepower, the turbocharger can become the weak link in the quest to reduce the harmful exhaust gas temps. The Scotty Air II can very easily save your engine from a costly meltdown.